Received September 16, 2002. Accepted March 31, 2003. In the proximal tubule of the kidney, parathyroid hormone (PTH) regulates the activity of the Na-H exchanger 3 (NHE3), Na-K ATPase, and the type IIa sodium phosphate cotransporter (NaPi IIa) through protein kinase A (PKA)- and protein kinase C (PKC)-dependent signaling pathways (1–7⇓⇓⇓⇓⇓⇓). Weinman et al. (8–11⇓⇓⇓) reported that the acute regulation NHE3 by agonists such as PTH that increase intracellular cAMP requires a protein called Na-H exchanger regulatory protein (NHERF). NHERF-1 and NHERF-2 are docking proteins that assemble multiprotein signaling complexes, including ezrin, NHE3, and PKA, through their multiple PSD-95/Discs Large/ZO-1 (PDZ) domains (12). These protein-signaling complexes facilitate the phosphorylation of NHE3 by activated PKA, thereby inhibiting its activity (8,13,14⇓⇓). We previously reported that opossum kidney (OK) cells expressing an ezrin-binding domain–deficient truncation of NHERF-1, mNHERF-1 (1–325) in OK cells, results in disruption of the association between endogenous OK cell NHERF and NHE3 and a loss of regulation of NHE3 by cAMP (15). The potential role of NHERF in PTH and cAMP regulation of Na-K ATPase and NaPi in proximal tubule of the kidney has not been explored. In the present studies, we examined the activity and regulation of these two transporters in OK cells expressing either wild-type mNHERF-1 (1-355) or mNHERF-1 (1-325). Previous studies in heterologous expression systems and yeast-2 hybrid assays have indicated that both NHERF-1 and NHERF-2 are capable of supporting cAMP-associated inhibition of NHE3 and binding to NaPi IIa (16). Recent experiments have indicated that the proximal tubules of human (17) and mouse (18) express both NHERF isoforms. OK cells, like rat proximal convoluted tubule (19), however, express only NHERF-1 (15), thereby allowing focus on the role of the NHERF-1 isoform. The results indicate that while PTH inhibits Na-K ATPase activity in cells expressing native or mNHERF-1 (1-355), the hormone stimulates the activity of Na-K ATPase in mNHERF-1 (1-325) expressing cells associated with reduced serine phosphorylation of the α subunit of Na-K ATPase. Moreover, mNHERF-1 (1-325) expressing cells have lower basal NaPi IIa activity, but the decrease in the membrane expression and activity of this transporter in response to PTH is not different from cells expressing full-length mNHERF-1 (1-355). These findings are consistent with the conclusion that NHERF-1 is involved in NaPi IIA targeting to and/or retention in the apical membrane but not in the mechanisms responsible for membrane retrieval of the transporter in response to cAMP. OK cells are a continuous cell line derived from Virginia opossum and a widely used model for mammalian renal proximal tubule (20). These cells exhibit several characteristics of mammalian renal proximal tubules, including a polarized morphology; apical expression of sodium-phosphate co-transporters; and regulation of phosphate uptake by PTH, PKA, and PKC. 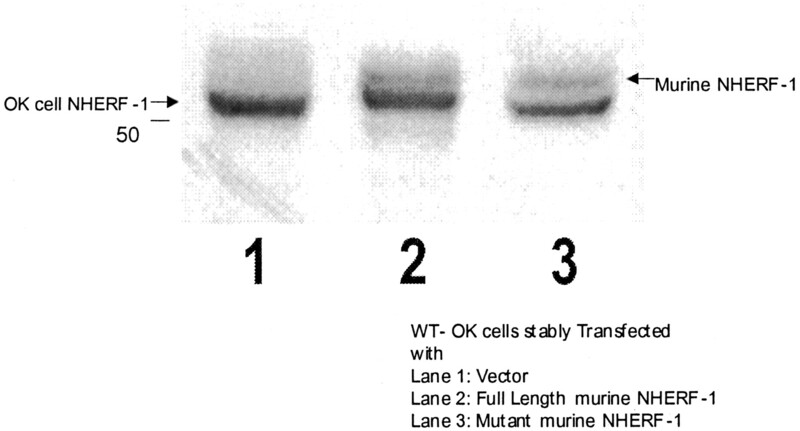 OK cells stably transfected with full-length murine NHERF-1 (mNHERF-1 [1-355]), a C-terminal deletion murine NHERF-1 lacking the ezrin-binding domain (mNHERF-1 [1-325]), or pcDNA3.1/Hygro+ vector (15) were maintained at 37°C in a humidified atmosphere with 5% CO2 in DMEM/F12 medium (1:1) supplemented with 10% vol/vol FCS, penicillin (100 U/ml), streptomycin (100 μg/ml), and 600 U/ml hygromycin. OK cells stably transfected with pcDNA/Hygro+ (vector), mouse NHERF-1 WT (NHERF), or C-terminal 30 amino acids deleted mutant NHERF-1 (NHERF Mutant) were treated with PTH 10−7M for 15 min or 2 h. The cells were lysed in 30 mM Histidine buffer (pH 7.4) and lysate homogenized by high-speed homogenizer (20000 rpm) three times for 15 s with an interval of 15 s. The homogenate was centrifuged at 2500 rpm for 5 min to remove cell debris, and the crude membranes were prepared by centrifugation at 18000 rpm for 30 min. The membrane fraction was resuspended in the same buffer. All steps were done at 4°C unless otherwise mentioned. Na-K ATPase activity was measured according to the method of Hird et al. (21) with slight modifications as described by Tran and Farley (22). Briefly, Na-K ATPase activity is measured by assessing its ability to cleave p-nitrophenyl phosphate to p-nitrophenol in the presence of high molar concentration of potassium. Twenty microliters of the membrane was added to 0.88 ml of assay buffer (30 mM Histidine, 150 mM KCl, 20 mM MgCl2, 2 mM EGTA [pH 7.4], and 10 mM p-NPP). Ouabain sensitive Na-K ATPase activity was measured by adding 10 mM ouabain to the assay medium. The assay mixture was incubated for 15 min at 37°C. The reaction was stopped by the addition of 100 μl of 5 N NaOH containing 0.1% Triton-X100. A standard curve was made by serial dilutions of p-nitrophenol, and the color was read at 410 nm. The assay was run in triplicate, and the activity is expressed as micromoles of p-nitrophenol released per milligram of protein per hour. The crude membranes were precleared with Protein A-Sepharose beads for 2 h at 4°C and were incubated with 1 ng of rabbit polyclonal antibodies against the α subunit of Na-K ATPase (Research Diagnostics, Flanders, NJ) overnight at 4°C. Protein A-Sepharose beads were added and incubated for 2 h at 4°C. The beads were washed three times with 1× PBS, and an equal volume of 2× Laemmli sample buffer was added and boiled for 5 min. The beads were centrifuged, and the proteins were separated by 10% SDS-PAGE transferred to nitrocellulose membranes and blotted against phosphoserine antibodies (Zymed Laboratories, San Francisco, CA). 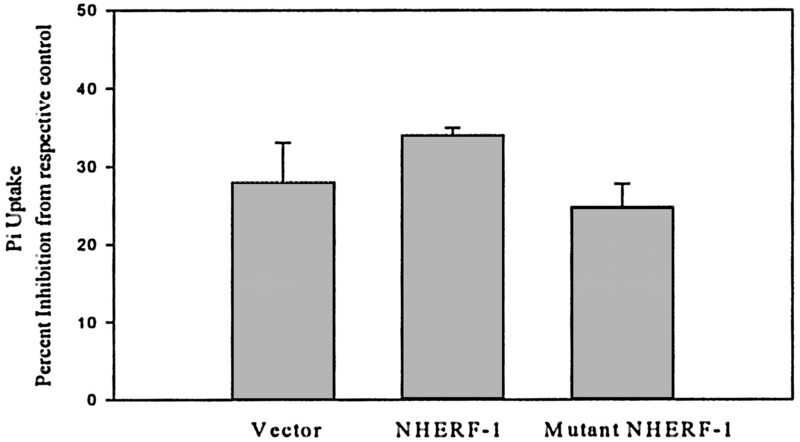 Immunoprecipitation of NHERF-1 was carried out in cell lysates similarly. NaPi-4 was immunoprecipitated using the Seize-X kit (Pierce, Rockford, IL) according to the manufacturer’s protocol. Phosphate transport was measured by determination of radiolabeled phosphate uptake. OK cells were seeded onto six-well plates (Corning, Palo Alto, CA) and grown to 100% confluence. Twenty-four hours before the assay, the cells were serum-deprived by washing in serum-free medium. The cells were treated with 10−7 M PTH, 10−4M 8-Br-cAMP, or 10−6 M phorbol myristate acetate (PMA) for 2 h at 37°C. The medium was removed, and the cells were washed three times with transport medium consisting of (in mM) 137 NaCl, 5.4 KCl, 2.8 CaCl2, 1.2 MgSO4, and 0.1 KH2PO4. Phosphate uptake was initiated by addition of transport medium containing 32P-labeled phosphoric acid. Uptake was continued for 10 min at room temperature, after which the cell monolayers were washed three times with ice-cold stop solution that differed from transport medium in that N-methylglucamine was substituted for sodium chloride and 32P was omitted. The cells were solubilized in 500 μl of 0.5% Triton X-100 for 90 min at room temperature. A 100-μl aliquot was aspirated in a scintillation vial to which 3 ml of the scintillant was added and analyzed by liquid scintillation spectroscopy. Each assay was performed in triplicate and averaged, and the mean was considered as a single data point. The cells were washed twice with HBSS and homogenized in 300 mM mannitol, 5 mM HEPES-Tris buffer (pH 7.6) using a 27.5-G needle. The cell lysate was centrifuged at 2000 rpm for 10 min to remove the cell debris, and crude membranes were isolated by centrifugation of the supernatant at 17,000 rpm for 30 min. The pellet was resuspended in 300 mM mannitol 5 mM HEPES-Tris buffer (pH 7.6). Brush border membranes were prepared at 4°C using the MgCl precipitation method. OK cells grown on semipermeable membrane inserts were homogenized in 50 mM mannitol and 5 mM Tris-HEPES (pH 7.0) by high-speed homogenizer (20,500 rpm). MgCl was added at 10 mM and stirred for 20 min. The homogenate was centrifuged at 2000 × g. The supernatant was recentrifuged at 35,000× g for 30 min, and the pellet was resuspended in 300 mM mannitol and 5 mM Tris-HEPES (pH 7.4) and centrifuged at 35,000 × g for 20 min. The membrane pellet was washed three times. These membranes demonstrate a sixfold increase in enrichment for NaPi-4 and for the brush border membrane enzyme γ-glutamyl transpeptidase, when compared with crude membrane preparations. The OK cell membranes were solubilized in Laemmli sample buffer, subjected to 10% SDS-PAGE, and transferred electrophoretically to nitrocellulose (Trans-Blot; Bio-Rad Laboratories, Hercules, CA) The membrane was incubated in 5% milk in 20 mM Tris, 50 mM NaCl, and 0.05% Tween 20 (TTBS) at room temperature for 1 h to inhibit nonspecific binding and then incubated overnight at 4°C with primary antibodies (NaPi-4, 1:2000; NHERF, 1:3000; or Na-K ATPase α 1 subunit, 1:1000) in 5% milk in TTBS. Location of specific antibodies was detected by incubation with peroxidase-labeled goat anti-rabbit HRP-linked IgG at 1:5000 dilution in 5% milk in TTBS, followed by development with enhanced chemiluminescence (New England Biolabs, Beverly, MA). The bands imaged by chemiluminescence were analyzed by densitometry. The films were scanned using a Personal Densitometer SI (Molecular Dynamics, Sunnyvale, CA). NaPi-4 full-length or deletion mutant (DM-4) was shuttled from NaPi-4 PCR2.1 plasmid into the EcoRI site of GST-pGEX-3. The ligated GST–pGEX3–NaPi-4 cDNA was transformed into Escherichia coli DH5α. Positive colonies were selected by restriction endonuclease mapping using restriction enzymes EcoRI and SacI and Mlu1 for orientation. The constructs were also confirmed by sequencing. The GST–pGEX-3–NaPi-4 or GST–pGEX-3–DM-4 plasmid was transformed into E. coli BL21PlysS, and the expression and purification of GST and GST–NaPi-4 or GST–DM-4 fusion protein was performed as described previously by Zu et al. (23). Briefly, a fresh overnight culture of E. coli BL21 transformed with GST–pGEX-3, recombinant GST–pGEX-3–NaPi-4, or GST–pGEX-3–DM-4 was diluted 1:10 in 2× YT medium containing ampicillin (100 μg/ml) and grown at 37°C. After this reached an absorption of 0.6 at 600 nm, isopropyl-β-D-thiogalactopyranoside was added to a final concentration of 0.1 mM and the bacterial growth was continued for 4 h at 37°C. Cells were harvested, washed once with PBS, and lysed in PBS containing 0.5% Triton X-100 and 5 mM Pefabloc by mild sonication on ice. The samples were centrifuged at 10,000 × g for 15 min at 4°C. Samples (10 ml) of bacterial supernatant were rocked for 30 min at 4°C with 800 μl of glutathione Sepharose beads previously washed three times and resuspended in PBS with 0.5% Triton X-100. The beads were washed 8 to 10 times with 10 mM Tris-HCl (pH 7.4), 1 mM EDTA, and 50 mM KCl and resuspended in PBS with 0.5% Triton X-100. OK cells grown on six-well plates (Corning) were washed with HBSS and lysed with 200 μl of IP lysis buffer containing 20 mM Tris-HCl (pH 7.4), 150 mM NaCl, 1% (vol/vol) Triton X-100, 0.5% (vol/vol) Nonidet P-40, 1 mM EDTA, 1 mM EGTA, 20 mM sodium orthovanadate, 20 mM NaF, 5 mM AEBSF, 21 μg/ml aprotinin, and 5 μg/ml leupeptin. The lysates were precleared by incubation with GST–Glutathione Sepharose beads for 2 h at 4°C. After this preclearing step, GST–NaPi-4, GST–DM-4, GST vector, or Glutathione Sepharose beads were added to the lysates and incubated at 4°C overnight on a rotator. The beads were washed three times with Krebs Plus buffer, and 40 μl of 2× Laemmli buffer was added to each tube. The samples were boiled for 5 min and then subjected to 10% SDS-PAGE. Proteins were transferred onto nitrocellulose for immunoblot analysis. Protein concentration was determined by DC protein kit (Bio-Rad) using BSA as standard. Data are shown as mean ± SEM. The n values shown represent the number of separate experiments. Each experiment was done in triplicate. P value is calculated using SigmaStat software utilizing t test. P < 0.05 was a priori considered statistically significant. 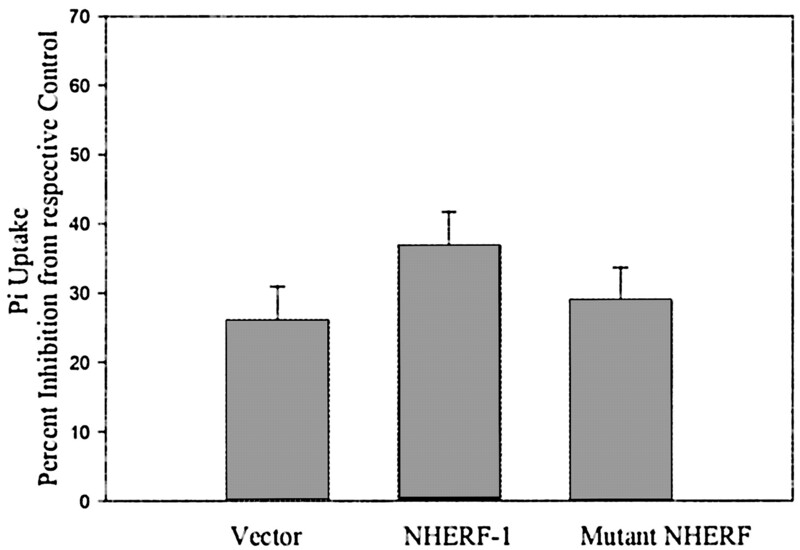 OK cells express endogenous NHERF-1 with an apparent molecular weight that is lower than mouse or rat NHERF-1 (15). Thus, as shown in Figure 1, expression of mNHERF-1 (1-355) and mNHERF-1 (1-325) was readily evident. Moreover, the abundance of these proteins was not affected by treatment with PTH (data not shown). In these same cell lysates, we were unable to detect NHERF-2 using antibodies specific for NHERF-2 (not shown). Figure 1. Expression of murine sodium-hydrogen exchanger regulatory factor (NHERF) in opossum kidney (OK) cell lines. OK cell monolayers expressing vector, wild-type murine NHERF-1, or mutant NHERF-1 lacking the ezrin-binding domain were lysed, and the proteins were separated by 10% SDS-PAGE, transferred electrophoretically to nitrocellulose membrane, and blotted for NHERF-1. The films were scanned using a Personal Densitometer SI. PTH inhibits Na-K ATPase activity in proximal renal tubule cells through PKA- and PKC-dependent signaling pathways (3,4,6⇓⇓). To determine whether NHERF was required for this process, we measured Na-K ATPase activity in cells expressing vector, wild-type murine NHERF-1, or the NHERF-1 deletion mutant before and after treatment with PTH. As shown in Figure 2, PTH produced decreased Na-K ATPase activity in cells expressing vector or wild-type NHERF-1. By contrast, in cells expressing NHERF-1 (1-325), treatment with PTH stimulated a paradoxical rise in Na-K ATPase activity. To examine the mechanism of this response, we measured PTH-stimulated serine phosphorylation of the α subunit of Na-K ATPase in the three cell lines. Cells that were treated with vehicle or 10−7 M PTH for 15 min were lysed and immunoprecipitated with antisera directed against the α 1 subunit of Na-K ATPase. The immunoprecipitates were subjected to 10% SDS-PAGE and blotted with antiphosphoserine antibodies. Figure 3 demonstrates that in cells expressing vector or wild-type mNHERF-1, PTH stimulated an increase in serine phosphorylation of the band representing the α 1 subunit of Na-K ATPase. However, in cells expressing the mutant mNHERF-1 (1-325), PTH-stimulated phosphorylation of the α 1 subunit was markedly attenuated. Of note, baseline Na-K ATPase activity in cells expressing the NHERF mutant was lower than in vector- or wild-type NHERF–transfected cells. Figure 2. Expression of NHERF mutant abolishes parathyroid hormone (PTH) regulation of Na-K ATPase activity. OK cell monolayers expressing vector, wild-type murine NHERF-1, or mutant NHERF-1 lacking the ezrin-binding domain were incubated at 37°C with either vehicle or bovine PTH 1-34 10−7 M for 2 h. Na-K ATPase activity was measured in the crude membranes as described in the Materials and Methods section. The assay was run in triplicate, and the activity is expressed as micromoles of p-nitrophenol released per milligram of protein per hour. *Significantly different from respective controls (untreated cells); ¶significantly different from vector-transfected cells; n = 6. Figure 3. Expression of NHERF mutant decreases PTH-stimulated phosphorylation of the α subunit of Na-K ATPase. OK cell monolayers expressing vector, wild-type murine NHERF-1, or mutant NHERF-1 lacking the ezrin-binding domain were incubated at 37×C with either vehicle or bovine PTH 1-34 10−7 M for 15 min. Na-K ATPase was immunoprecipitated from the crude membranes as described in the Materials and Methods section. The immunoprecipitated membrane proteins were separated by 10% SDS-PAGE, transferred to nitrocellulose membrane, and blotted with antiphosphoserine antibodies; n = 3. We and others have previously shown that PTH activates PKA and PKC (2,5⇓). Treatment of OK cells with PTH or direct activators of either PKA or PKC decrease Pi uptake in OK cells (2). 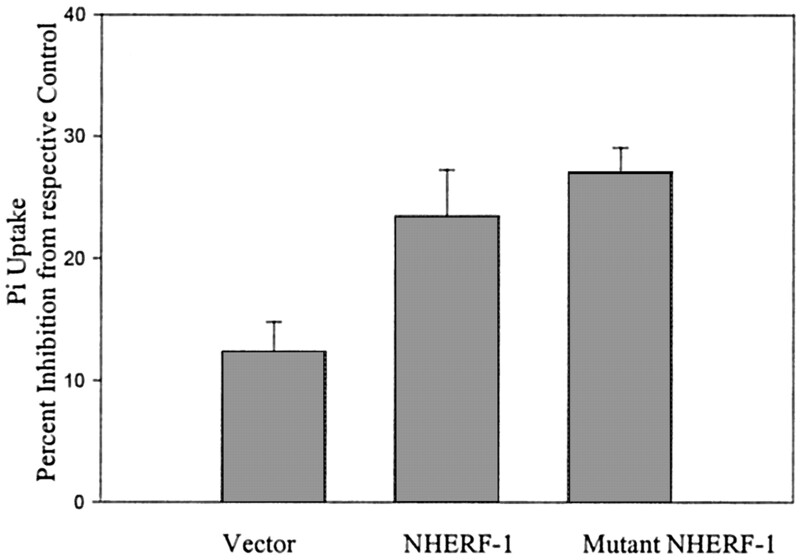 For determining whether NHERF-1 is required for the regulation of Pi uptake by either of these pathways, OK cells stably transfected with wild-type mNHERF (1-355), mutant mNHERF (1-325), or pcDNA3.1/Hygro+ vector were treated with 10−4 M 8-Br-cAMP, 10−6 M PMA, or 10−7 M PTH 1-34 for 2 h at 37°C. 8-Br-cAMP (Figure 4), PMA (Figure 5), and PTH (Figure 6) all inhibited the Pi uptake by a similar percentage in all of the cell groups. Notably, baseline phosphate uptake was significantly decreased in cells expressing the mNHERF-1 (1-325) compared with wild-type mNHERF (5.77 ± 0.38 versus 4.47 ± 0.43 pmol/mg protein per min). Figure 4. Expression of NHERF mutant has no effect on regulation of phosphate uptake by protein kinase A (PKA). OK cell monolayers expressing vector, wild-type murine NHERF-1, or mutant NHERF-1 lacking the ezrin-binding domain were incubated at 37°C with either vehicle or 8-bromo-cAMP 10−4 M for 2 h. Phosphate transport was measured by determination of radioactive phosphate uptake for 10 min. Results are expressed as percentage inhibition (Pi uptake) from respective controls. There was no significant difference between the groups; n = 8. Figure 5. Expression of NHERF mutant has no effect on regulation of phosphate uptake by protein kinase C (PKC). OK cell monolayers expressing vector, wild-type murine NHERF-1, or mutant NHERF-1 lacking the ezrin-binding domain were incubated at 37°C with either vehicle or phorbol myristate acetate (PMA) 10−6 M for 2 h. Phosphate transport was measured by determination of radioactive phosphate uptake for 10 min. Results are expressed as percentage inhibition from respective controls. There was no significant difference between the groups; n = 8. Figure 6. Expression of NHERF mutant has no effect on regulation of phosphate uptake by PTH. OK cell monolayers expressing vector, wild-type murine NHERF-1, or mutant NHERF-1 lacking the ezrin-binding domain were incubated at 37°C with either vehicle or bovine PTH 1-34 10−7 M for 2 h. Phosphate transport was measured by determination of radioactive phosphate uptake for 10 min. Results are expressed as percentage inhibition from respective controls. There was no significant difference between the groups; n = 8. Inhibition of phosphate transport by PTH is accompanied by a decrease in membrane expression of the sodium-phosphate co-transporter. This decrease in expression, which is first detectable within 1 to 2 h of PTH exposure, reaches a nadir by 6 to 8 h, at which time expression is reduced to <10% of control (2). To determine whether NHERF-1 was required for PTH-stimulated decrease in apical membrane NaPi-4 expression, we performed immunoblot analysis of crude OK cell membranes obtained from the three cell lines before and after treatment with PTH. Immunoblot for the NaPi IIa showed approximately 60% reduction in the membrane expression in OK cells expressing the vector, wild-type, or mutant murine NHERF-1 (1-325) after 2 h of treatment with PTH (Figure 7). Note that although total expression of NaPi-4 was similar in all three groups, brush border membrane (BBM) expression (insert) seemed higher in the cells expressing full-length murine NHERF than in the cells expressing the truncated NHERF, corresponding to the higher basal phosphate uptake in that group. Figure 7. Expression of NHERF mutant has no effect on PTH regulation of type IIa sodium-phosphate co-transporter (NaPi IIa) expression. (A) Expression of NaPi-4 in OK cells crude membranes (C) and brush border membranes (B) expressing vector, murine NHERF-1, or mutant NHERF-1 lacking ezrin-binding domain. (B) OK cell monolayers expressing vector, wild-type murine NHERF-1, or mutant NHERF-1 lacking the ezrin-binding domain were incubated at 37°C with either vehicle or bovine PTH 1-34 10−7 M for 2 h. The OK cell membranes were subjected to 10% SDS-PAGE, transferred electrophoretically to nitrocellulose, and blotted for OK cell type II NaPi co-transporter. The films were scanned using a Personal Densitometer SI. The bands imaged by chemiluminescence were analyzed by densitometry (C), and the results are expressed as ratio of arbitrary units of density per area scanned. Gisler et al. (16) demonstrated by yeast-2 hybrid assay that the carboxy terminus of the rat sodium-phosphate co-transporter can interact with NHERF-1 and NHERF-2. To confirm an association in OK cells, we performed a GST pulldown of OK cell lysates using full-length type IIa co-transporter–GST fusion protein or a C-terminal deletion mutant type IIa co-transporter–GST fusion protein and blotted the separated proteins for NHERF-1. As shown in Figure 8A, NHERF associates with the type IIa transporter even in the absence of the carboxy terminal PDZ binding domain. The immunoblot for NaPi-4 in the GST pulldowns confirms that the GST fusion protein contains the full-length NaPi-4 recognized by the carboxyterminal antibody and demonstrates the absence of nonspecific associations between the GST preparations and cellular proteins. Figure 8B, showing an immunoprecipitation with NHERF antibody and blot for NaPi-4, and Figure 8C, showing an immunoprecipitation with NaPi-4 antibody and blot for NHERF, further confirm an association between NHERF and NaPi-4. Figure 8. NHERF associates with the NaPi IIa. (A) NaPi-4 full-length or deletion mutant (DM-4) was shuttled from NaPi-4 pCR2.1 plasmid into the EcoRI site of GST–pGEX-3. The ligated GST–pGEX-3–NaPi-4 GST–pGEX-3–DM-4 cDNA or the GST vector was transformed into Escherichia coli BL21PlysS, and the expression and purification of GST and GST–NaPi-4 or GST–DM-4 fusion protein was performed as previously described in the Materials and Methods section. GST pulldown assay was carried out as described in the Materials and Methods section, and the GST vector, GST-WT NaPi-4, and GST–DM-4–bound proteins were subjected to 10% SDS-PAGE. Proteins were transferred onto nitrocellulose for immunoblot using antiserum to C-terminal 12 amino acids of NaPi-4 (top) or antibodies to murine NHERF-1 (bottom). (B) NHERF-1 was immunoprecipitated from WT-OK cells as described in the Materials and Methods section. The immunoprecipitated proteins were separated by 10% SDS-PAGE, transferred to nitrocellulose membrane. and blotted for NaPi-4. (C) NaPi-4 was immunoprecipitated using NaPi-4 antibodies covalently linked to Protein A Sepharose beads according to the Seize X method (47). The immunoprecipitated proteins were separated by 10% SDS-PAGE, transferred to nitrocellulose, and blotted for NHERF-1. NHERF-1 stained positive in the eluted sample (lane 3). NHERF-1 and NHERF-2 are modular adaptor proteins that contain two tandem protein interaction domains and a C-terminal ezrin-radixin-moesin-merlin binding domain. Since their initial description, these proteins have been found to interact with more than 30 protein targets, including membrane transporters and ion channels (15,24–27⇓⇓⇓⇓), scaffolding proteins (28), signaling proteins (15,29⇓), receptors (30–32⇓⇓), and transcription factors (33). NHERF-1 was initially identified as a co-factor required for PKA regulation of NHE3 (9). NHERF-2 was isolated from a yeast-2 hybrid screen using the C-terminus of NHE3 as bait (34). As determined from expression studies in fibroblasts, both proteins can function as a scaffolding protein facilitating the formation of a multiprotein complex including NHE3, ezrin, and PKA (11,13,14⇓⇓). This signal complex enables phosphorylation of NHE3 by PKA and downregulation of its activity. The study of the role of NHERF in cAMP regulation of NHE3 was recently extended to epithelial cells. Expression of an NHERF-1 mutant construct lacking the ezrin binding in OK cells resulted in a blunted inhibitory effect of cAMP on NHE3 activity (15). PTH, acting through PKA- and PKC-dependent pathways, regulates the activity of two other important transporters in the renal proximal tubule; Na-K ATPase (3,4,6,7,35–38⇓⇓⇓⇓⇓⇓⇓) and NaPi IIa (1–3,39⇓⇓⇓). The precise role of NHERF-1 in these regulatory responses has not heretofore been examined. Accordingly, we used the dominant-negative cell line expressing mNHERF-1 (1-325) used in our previous studies to examine PTH regulation of Na-K ATPase and NaPi IIa. The use of the OK cells is particularly appropriate because they express all of the native transporters present in intact kidney, readily express murine NHERF-1 after transfection, and, while expressing native NHERF-1, do not express significant amounts of endogenous NHERF-2. 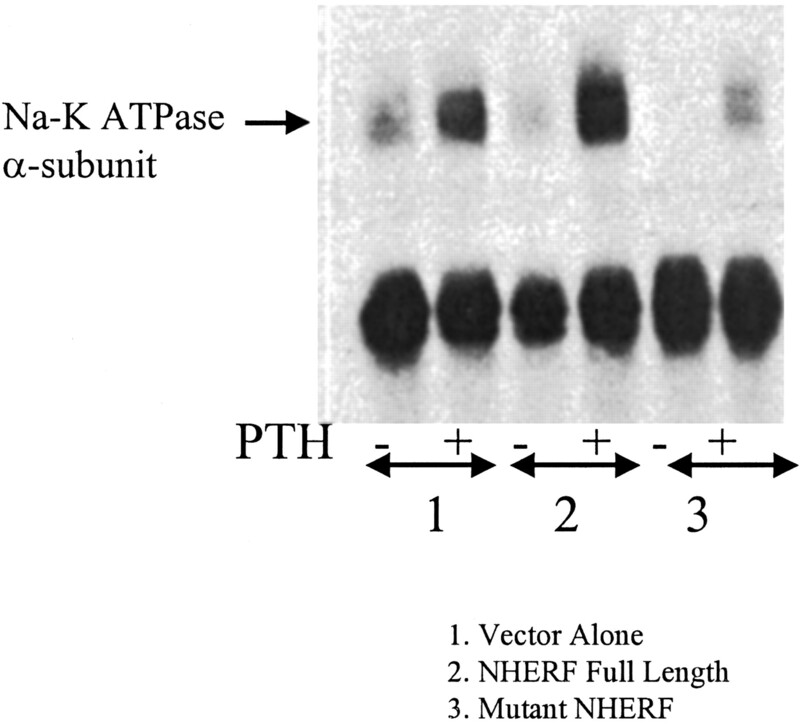 PTH inhibited Na-K ATPase activity in OK cells transfected with vector alone and expressing endogenous NHERF-1 and in cells expressing full-length mNHERF-1 (1-355). As previously documented, the inhibitory effect of PTH was associated with phosphorylation of the α subunit of the transporter (38). By contrast, expression of mNHERF-1 (1-325) resulted in stimulation of Na-K ATPase activity and blocked nearly completely PTH-associated phosphorylation of the α subunit. These findings suggest that NHERF-1–mediated phosphorylation of the α subunit of Na-K ATPase is important in the inhibitory effect of PTH. The mechanism for paradoxical stimulation of Na-K ATPase in cells expressing NHERF-1 (1-325) is unknown, and it has not yet been determined whether NHERF-1 binds to components of the Na-K ATPase. Of interest, however, NHERF-1 has been found to co-localize with the β subunit of H-ATPase in distal nephron segments, raising the possibility of a direct form of interaction between NHERF-1 and ATPases of this class (27). Another possibility to explain PTH stimulation of Na-K ATPase activity in NHERF-1 (1-325) expressing cells may relate to the interaction between NHERF and the signal transduction pathways of the PTH receptor itself. Previous studies have documented that activation of PKA inhibits Na-K ATPase activity (4). Efendiev et al. (40) reported that activation of PKC in OK cells has a biphasic effect on Na-K ATPase activity. At low intracellular concentrations of sodium, PMA stimulates Na-K ATPase activity but inhibits the transporter when the concentration of sodium in the cell is increased. Segre and co-workers (30) recently reported that the PTH receptor binds both NHERF-1 and NHERF-2 though a PDZ domain interaction. NHERF acts as a molecular switch and when bound to the receptor promotes activation of a phospholipase Cβ and inhibition of adenylate cyclase. It might be suggested, therefore, that if NHERF-1 (1-325) disrupted the association between NHERF and the PTH receptor, then the major mode of signaling would have been through cAMP, a pathway normally associated with inhibition of Na-K ATPase (4,6,38⇓⇓). It would also be predicted that NHERF-1 (1-325) would disrupt PTH signaling through a PKC pathway. The direct role of NHERF in PKC signal pathways has not been well studied, but it has been demonstrated that NHERF-1 binds to phospholipase β1 and 2 (41). Thus, it remains possible that disruption of either the PKA or PKC or possibly both pathways underlies the stimulatory effects of PTH on Na-K ATPase activity in mNHERF-1 (1-325) expressing OK cells. It should also be considered that PTH may stimulate Na-K ATPase by yet another signal pathway. It is not known whether NHERF-1 and Na-K ATPase bind one another in vivo. NHERF-1 is required for cAMP to inhibit the renal basolateral membrane sodium-bicarbonate cotransporter 1 (NBC1) in BSC-1 cells, but by contrast to the association of NHERF-1 with NHE3, NHERF-1 does not bind to NBC1, does not affect its phosphorylation state, and does not alter its abundance in the basolateral surface of the cell (25,26⇓). We have speculated that NHERF-1 mediates cAMP inhibition of NBC1 by an indirect mechanism involving additional but as yet unknown proteins. The association between NHERF-1 and Na-K ATPase may be similar. Consistent with this conclusion is preliminary co-immunoprecipitation experiments that indicate the NHERF-1 immunoprecipitates contain NaPi-4 but not the α subunit of Na-K ATPase. PTH is a major regulatory hormone controlling phosphate reabsorption in the renal proximal tubule by altering apical membrane expression of NaPi IIa (42). The regulation of NaPi IIa has a number of unique differences compared with NHE3. Although both transporters contain multiple phosphorylation sites on their C-termini, evidence to date indicates that phosphorylation of NaPi IIa does not affect its activity (39), whereas PKA phosphorylation of NHE3 acutely downregulates NHE3 activity (15). Moreover, whereas a significant fraction of internalized NHE3 is recycled back to the apical membrane (43), almost all internalized NaPi IIa is targeted for lysosomal degradation (44). Thus, hormones and dietary manipulations that alter the renal tubular reabsorption of phosphate regulate the cell surface expression of the NaPi IIa transporter. It is suggested that the pathways that result in insertion of NaPi IIa into the apical membrane are distinct from those that retrieve the transporter. In the present experiments, basal sodium-dependent phosphate transport was lower in mNHERF-1 (1-325) expressing cells compared with mNHERF-1 (1-355) cells. This suggests less NaPi IIa transporters in the cells expressing the ezrin-binding domain–deficient truncation. We recognize that this conclusion is speculative given the known difficulties in comparing expression in mixed or even clonal cell lines. Nonetheless, in support of this supposition, Murer and colleagues (45) recently reported that NHERF-1 is an important targeting and/or membrane retention signal for NaPi IIa. We recently reported that NHERF-1 knockout mice have phosphaturia associated with decreased expression of NaPi IIa in the renal proximal tubule apical membrane (46). These observations suggest a role for NHERF-1 in determining the abundance of NaPi IIa in the apical membrane. Our finding of a similar total cellular content of NaPi-4 but a decreased BBM expression in NHERF mutant–expressing cells relative to the cells expressing full-length NHERF is also consistent with a role for NHERF in apical membrane targeting. Although the effect of NHERF-1 on membrane targeting is not entirely conclusive, we think a most interesting and important observation in the present experiments was the findings that the response to PTH was similar in all cell lines studied characterized by decrease sodium-dependent phosphate uptake and decreases expression of NaPi IIa. These results suggest that NHERF-1 is not involved in NaPi IIa retrieval from the apical membrane. As such, these studies provide an intriguing insight into the association of NHERF-1 in the regulation of NaPi IIa and phosphate balance. The mechanism by which NHERF-1 interacts with NaPi IIa has not been well defined. Gisler et al. (16) suggested a canonical binding interaction involving the PDZ domains of NHERF-1 and the C-terminal amino acids of NaPi IIa. We believe, however, that the relation between the proteins is more complex. We recently reexamined the association between NHERF-1 and NHE3 and determined that these proteins bind using not only a classic PDZ interaction but also at some internal upstream site of NHE3 (E.W., unpublished observations). We have also developed evidence in osteoclasts that NHERF-1 and NaPi IIa interact with each other via a PDZ domain interaction as well as at a site upstream in the NaPi IIa protein. (Gupta et al., unpublished observations). For pursuing these observations in OK cells, pulldown studies were performed using wild-type and a C-terminal truncation of NaPi IIa. As shown in Figure 8, NHERF-1 was recovered when both native NaPi IIa and the NaPi IIa recombinant protein lacking a canonical C-terminal PDZ domain were used. When considered together, these results suggest a more complex association between NHERF-1 and NaPi IIa. The physiologic significance of these putative multiple binding sites, however, remains to be determined. In summary, the present experiments extend significantly the understanding of the role of NHERF-1 in the hormonal control of electrolyte transport. In a renal epithelia cell line, OK cells, disruption of putative association between NHERF-1 and ezrin results in decreased phosphorylation of the α subunit of Na-K ATPase activity and a paradoxical stimulation of Na-K ATPase activity in response to PTH. In addition, whereas basal sodium-dependent phosphate transport is decreased in NHERF-1 (1-325) expressing cells, PTH results in normal degradation of NaPi IIa and inhibition of phosphate transport. Finally, NHERF-1 and NaPi IIa likely interact with one another using not only a classic PDZ interaction but also a binding interaction involving internal sites in the NaPi IIa protein. This work was supported by funds provided by the Veterans Administration Review Board (E.D.L.). J.K. is the recipient of a fellowship grant from the Ohio Valley Affiliate of the American Heart Association. E.W. was supported by grants from the National Institutes of Health, DK 55881, and Research Service, Department of Veterans Affairs. We graciously acknowledge the excellent technical assistance of Nina Lesousky and Deborah Steplock.